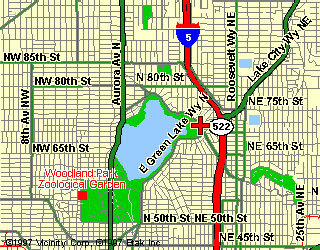 Green Lake is bounded by Wallingford on the south, Greenwood/Phinney Ridge to our west, Licton Springs/Maple Leaf to our north, and Roosevelt to the east. The neighborhood is mostly single family units with apartments and multi-family housing in the residential urban village area at the east side of the neighborhood. The park/lake has no real entrance as you can enter anywhere around the park. The business district is located on the east side of the park. There are also businesses in the Aurora area, in the Meridian area, and near the wading pool. There are sports orientated shops like Gregg’s Greenlake Cycle, Road Runner Sports and Super Jock & Jill. You can shop for food at the Green Lake PCC and Green Lake / Aurora PCC, buy an ice cream at Ben & Jerry’s Ice Cream, located next to Zeek’s pizza across from the wading pool at Greenlake. There is a new Bartell’s Drugs in the Eddy Building on NE 71st Street. We have doctors, therapists, lawyers, and a really good vet. We have pharmacies, dry cleaners, and a nice neighborhood Bank (Key Bank) as well as a new Homestreet Bank. Our businesses reflect the wonderful diversity that is Green Lake. Dog walking on the path around Green Lake. A soccer game in one of the fields at East Green Lake Beach. We have coffee shops, high end restaurants, casual restaurants. We have a number of good local watering holes including The Latona Tavern, Shelter Lounge, Lunchbox Laboratory, and Dukes Green Lake Chowder House, and there are also lots of favorites that defy categories such as the Zoka’s, the Little Red Hen, the Urban Bakery, Beth’s Cafe, Spud Fish and Chips, Teddy’s Bigger Burgers, Tacos Guaymas, Zeek’s Pizza, Thai Ocean, Mykonos Greek Grill, Kidd Valley Hamburgers, Rosita’s, Mona’s Bistro, and the high end Nell’s Restaurant and Lucia Italian Kitchen. And more. To foster a greater sense of community among all who live, work and play here. To work with governmental agencies so that their policy and actions enhance the quality of life at Green Lake. To provide a place for information to be shared and discussed in ways that will include all members of our community. To find ways to contribute to the community character by encouraging activities that preserve the quality of the park and neighborhood. To cooperate with other community councils and organizations in working for improvement of the quality of life in the city of Seattle and its environs. To send an email to a Green Lake Community Council officer, click on an underlined name above or use Contact form to submit comments.